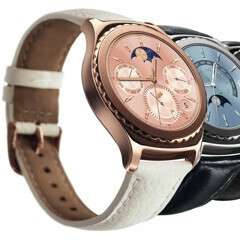 In early January, at CES 2016, Samsung announced two new variants of its Gear S2 Classic smartwatch, both trying to lure customers who want a touch of luxury on their wrists: Gear S2 Classic Rose Gold, and Gear S2 Classic Platinum. Released a few weeks back in China, the Samsung Gear S2 Classic Rose Gold and Gear S2 Classic Platinum are now ready to be launched in the US. Interested buyers will be able to get the two smartwatches starting tomorrow, February 12, both online (via Samsung.com and Amazon, among others), as well as in retail stores across the US (including at Best Buy and Macy's). The Gear S2 Classic Rose Gold is plated in 18K rose gold, while the other new variant of the smartwatch is obviously plated in platinum. The two devices have the same price: $449.99 - that's $150 higher than the price of a regular Gear S2 Classic (which has been available since late 2015, and currently costs $299.99). Running Tizen OS (instead of Android Wear), all Samsung Gear S2 Classic variants distinguish themselves with the presence of a rotating bezel that help users navigate through notifications, apps, and widgets. The Gear S2 Classic is compatible with many Android devices (they need to run at least Android 4.4 KitKat, and to offer no less than 1.5 GB of RAM). If you want to take a closer look at the two latest variants of Samsung's smartwatch, check out our Gear S2 Classic Platinum and Rose Gold hands-on. And let us know if you're willing to pay $449.99 for any of them, will you? Looks really good. French website is saying iPhone compatibility is coming in March. Yes to platinum. But please, Samsung, make the next iteration a little larger screened. Those default watch faces, really bring out the look too. I just feel they aren't worth $449. Paying $360 for the Gear S2 is the most I've ever paid for a watch EVER and I bought some expensive ones in the past. I will wait for the GS4 Classic, so I can get those cheaper. I really love my Gear S2. Using it at the gym with the internal 4gb of music storage + bluetooth headset means no phone in my pocket, plus it can also run the S Health app at the same time and monitor my HR during cardio and keep an ongoing log of it all. Very happy with it.